When the Green Lantern, Sinestro, turned rogue, the Guardians of the Universe named Katma Tui his replacement. Katma Tui served with distinction for a long time before retiring. She returned to service at the urging of Hal Jordan, the Green Lantern of Earth, and trained Jordan's replacement, John Stewart. Katma Tui came to love Stewart, and the two of them married, but Katma Tui was murdered shortly thereafter by longtime Green Lantern foe Star Sapphire. I must confess, and please don't pelt me with stones of translucent green willpower, but I'm coming to this party pretty late. Like any rational fanboy, I've always liked Green Lantern, but the characters where never that compelling for me and certainly there was never any story that lived up to the concept of a structured intergalactic police force - at least until Sinestro Corps War and Blackest Night - so I stuck to the team books and Marvel mostly. So basically, what you see above is the extent of my knowledge of the character. The figure is based on the Harley Quinn body from way back in Series 2 with new pieces as needed. The re-use is fine but the effect is a creepily thin woman, especially her tiny arms. They're so thin I can't help but be distracted by them. Her head is the only notable new piece here, and let me take this moment to ponder why Sinestro is the only Korugarian to ever have the elongated skull. What's up with that? Sure it's goofy but if everyone has one then at least is a species thing. Anyway, thanks to the rampant and infuriating double barbell neck joints her head has only swivel options meaning that, similar to the Hawkgirl figure, John Stewart's other sweetheart, her head is stuck looking down. So, like any good woman she has the option of keeping her gaze down on the floor or thrusting her chest up and out. 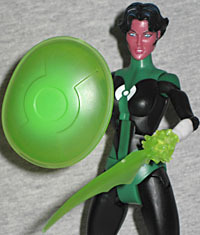 Much like John Stewart, she too comes with multiple accessories - in this case two ring constructs and one big BAF Kilowog piece (the humungous torso). Like John's, her constructs follow the pattern of one very common construct and one... not as much. For the former, John had the big hand; Katma has a shield, complete with sculpted rim and lantern logo. Its very smooth and well defined which is fine, but I do prefer my constructs to be a bit more "ethereal" and less "perfect," for lack of a better word. Her weapon construct is a wicked cool sword. She suffers the same spiky "mace-hand" effect that John's constructs had, resulting from trying to sculpt light-energy. A decent attempt but not very good execution I must lament. The sword has a great scalloped shape to it, but is basically backwards from how it looks, with the blade curving in with the fingers like Wolverine's claws. The constructs are neat and greatly appreciated but I just can't find a pose with them that I like, and they will only fit on Katma's teeny tiny hands, so alas... into the box they go. For a lesser-known character this is a pretty solid figure. I wouldn't recommend her to the casual buyer, but for those of us who need as many Green Lanterns as we can get and/or will buy anything DCU you will be happy with this figure - especially since she completes Kilowog!